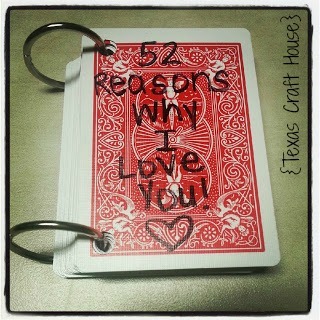 This simple, easy gift could really be used for any person and for any occasion or holiday. I would love to receive something like this from a friend, family member or my husband. It is so personal and meaningful and the best part… it’s simple! Why spend a fortune on an expensive gift when sometimes a kind word or two will leave an even bigger impression. 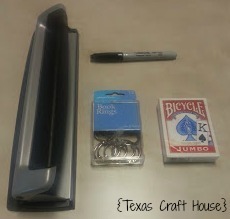 Here are the materials: A deck of cards (I used the jumbo kind), a sharpie, book rings (found in the office department) and a hole punch. My total was under $5.00 because I already had a sharpie and a hole punch. 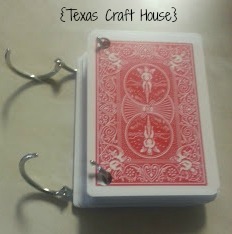 If you don’t have these items already they will come in handy in any craft room. 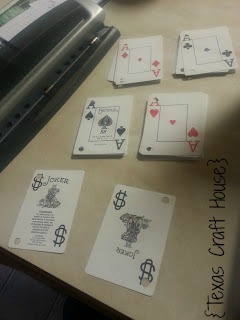 Here are the cards separated by suite and hole punched. 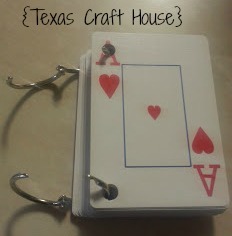 You could do one, two or three hole punches per card but I liked the way it looked with just two. When I put the cards on my rings I put the heart suite first since it was Valentine’s Day. You could really make your “book” any way you want though. 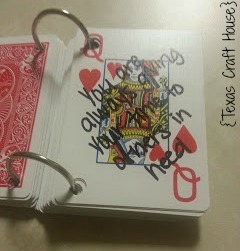 Then I used the joker cards as the front and back covers of my book. Here is the finished product. 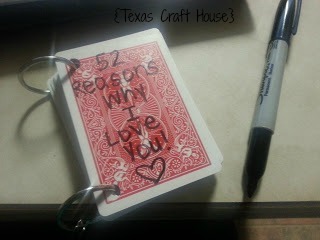 I used the sharpie to write the 52 reasons why I love you, one reason per card. Here are some pictures of my inside cards. This one says, “You’re always giving your time to others in need.” My husband is very much a handy man and will do anything for anyone. If someone calls for a favor he is always saying yes. 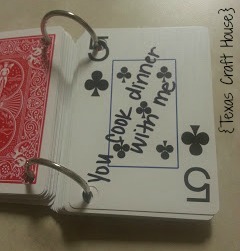 This one says, “You cook dinner with me.” We always make a point to make dinner together when our work schedules match up. These are some of my favorite nights and memories as we stand around prepping and cooking our dinner and talking about our day (and future). 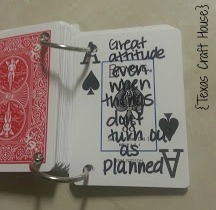 This one says, “Great attitude even when things don’t turn out as planned.” My husband does not have very good luck… If something can go wrong it usually does 🙂 … he never complains, gets discouraged, or mad… he just moves onto plan B. “You’d rather use gorilla glue than stitches.” My husband has cut himself numerous times while playing with a project out in the shop or garage… One time he cut his finger pretty bad and instead of going to the doctor he used gorilla glue. Only my husband. Here is the cover of the completed book! I left it on the counter when I went to work on Valentine’s Day and he was sleeping. He told me later that day he loved it so much and loved reading it. He said he looked through it numerous times through out the day. At work, our boss was turning 40 and we used this same idea as a gift for her. 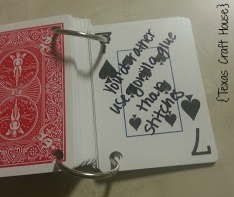 We took out the royal cards and just used 1-10 and the jokers to make a “40 Things We Love About You” book. Each employee was assigned a card and filled out a “page” then we attached them and gave it to her. Our boss loved it and even cried. This gift could really be adapted for any holiday, occasion or person. What is a great Valentine gift you’ve given before?